Note: If you have a serious health condition, I strongly advise not to try this out. 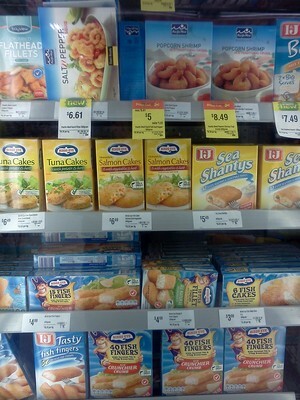 When I was a little kid, my parents forbade me from having the frozen delights of Fish Fingers. Every Friday, when my mum would do the weekly shopping, I would always run towards the frozen food section of the supermarket, grab a packet of fish fingers and try and hide it somewhere in the trolley under other items in the hope that my mum would just accidentally buy it. However every time I would fail miserably and my mum would always say something about how unhealthy it was or that we already have too much in the trolley. Just last week, as I walked around the supermarket to do my own groceries, I suddenly realised one of the many perks of adulthood: I can buy whatever I want! With this thought in mind, I conjured up a list of all the many savoury frozen delights I was denied in my childhood and threw a Frozen Food Dinner Party! Gather some friends and family, and rejoice the little perks of adulthood by organising a Frozen Food Dinner Party. 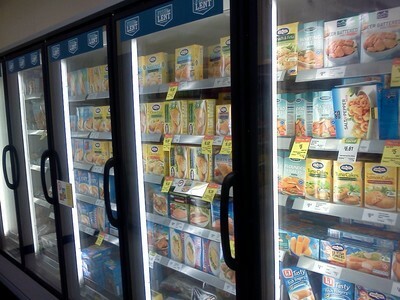 Head down towards your local supermarket, walk straight to the frozen food section and bask in all that frozen food glory! Get yourself a side of tartar sauce and enjoy that crunchy goodness in your mouth. Have Fish Fingers as a starter or perhaps enjoy it as the main course, it's all up to you. Another interesting way of having fish fingers that I recently found out is a good old fashion fish finger sandwich! May sound like the most bogan thing you can do, but by placing a couple of fish fingers in between two slices of bread with some tomato sauce creates a new style of frozen food fusion cuisine. Remember these delights? The greatness of a pizza inside a bread bun. This was the only thing I was allowed to have from the frozen food section and it definitely brought me back to my memories of having this as an after school snack. Just like chips, only made from chicken. Two wonderful words in the English dictionary combined together to make the ultimate frozen finger food. Every time I walk pass the frozen fish section of the supermarket, it always captures my eyes because of the delicious looking picture of that crumbed fish. It's clearly not as good as a fresh fish, but hey, if it looks good, it must taste good, right? Something about curliness of these fries makes the taste of it so much better than its straight counterpart. They don't sell these fun-to-eat fries in shops, so the more reason to buy these rare treats. Enjoy it as a side, or perhaps as a starter to the main course. I remember buying these pizzas and surprisingly they are delicious. Obviously they don't have the edge to it like a freshly cooked pizza, but my god, frozen pizza are a godsend. Think about it, it's late night, you're lazy to cook or too lazy to actually order a pizza over the phone, and sitting in your freezer is a entire frozen pizza, ready to be cooked and eaten. And to top of your wonderful banquet of frozen foods, why not end the night with dessert in the form of Viennetta. Do you remember this ice cream? It's the one that looks like a delicate cake with multiple layers of vanilla ice cream and chocolate bits. Doesn't your mouth just water and drool upon looking at this sweet, sweet goodness. Now if you all think that there is too much meat and not enough veg, well worry no more, for the great world of processed frozen food provides us with frozen veggies. In just a simple procedure of placing them in a pot of boiling water, these frozen veggies should provide some nutritional balance to your dinner party. Enjoy a side of frozen peas and carrots or perhaps have some pieces of sweet corn.